Сейчас идет снег в Oberstdorf-Nebelhorn ?Thank you! Oberstdorf-Nebelhorn is one of three ski areas in the Oberstdorf region. The others are Fellhorn and Söllereck. Oberstdorf-Nebelhorn has 12 kms of piste and 6 lifts to service the slopes, including 3 gondolas. The terrain at Oberstdorf-Nebelhorn is mainly suited to intermediates and the nearest airport is at Munich. I skied the Nebelhorn for 6 seasons as a ski instructor and on free days. It is my favourite place to ski in Germany. The mountain is essentially in two parts. 1. Above the tree line. Take the 2 stage cable car from the town to the end of the second stage. A large snow sure bowl is in front of you serviced by two chairs and a smaller cable car. Excellent variety and scope to choose from and fantastic views from the top. Several mountain restaurants serve brilliant food. 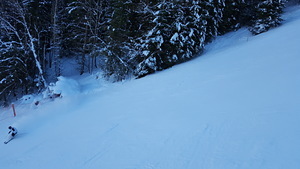 Of note is the mogul field below the top station. It is like a car park full of Volkswagens on a 50 degree slope. After it has been skied for a few weeks it is outrageous and intimidating, not for the feeble hearted. Tree line skiing. Take the run down the mountain to the Seealpe area. This can be quite challenging for lower intermediates but is very much worth the trouble. The trail is about 2 or 3 KM and ends at the mid stage of the two stage cable car. If there is sufficient snow you can go all the way to the town (another 2km) and ride back up. Alternatively you can get on the car back to the bowl. There are a few beginners lifts in this area..
Total top to bottom would have to be 6km and is a great run. If you are thinking of a ski trip to Germany and are looking at Garmisch, think again. The Oberstdorf area not only boasts the Nebelhorn but the Fellhorn and several great day resorts in Kleinwalsertal too.